Olathea and Lincoln both finished their championships in 2013, and Olathea went on to pick up her Rally Novice title in one weekend with 3 first place finishes– and one of those scores was a perfect 100! She picked up her CGC (canine good citizen) along the way and then at the Cardigan national specialty she earned her TDI( Therapy Dog International) certificate. We have moved on to the game of agility! She and I are having great fun and looking forward to our first trial late this summer. See ya around the pond! He is learning much good stuff…sit, stay, touch, charming his peeps, and the like. Good boy, Pip, you are making us proud! Yesterday I broke down the living room puppy pen, rolled up the vinyl, swept, mopped, and refreshed the hardwoods. My living room is officially back to normal. While I love the return to normal, I am kind of missing the Puppy TV channel! The puppies are completely mixed in general population. Mostly they run with Ella, Music and Russ…still working on Shaker and Rainbow. Right now they are playing tug of war with their mother in the kitchen. (I’ll try to get some pictures but it is a pretty fast paced game!) They are spending a couple of hours a day in crates so that I can accomplish some real work. The last puppy will move on to her forever home on Friday when Val and John make their way to Riverbend. I can only hope it will go smoother than Nadia’s move! I truly don’t think I can take another one like that! Speaking of Nadia, her new mom started a blog www.legendofnadia.blogspot.com. Tonight Olathea and I will hit our first conformation class, and tomorrow Lincoln will begin his first class. Puppy kindergarten starts for them this Saturday and next Thurs respectively. Looks like I am going to be busy keeping two, but I knew what I was in for and I am ready! But the official part is…yesterday they found the dishwasher! Now it is real, they really are Riverbend puppies! 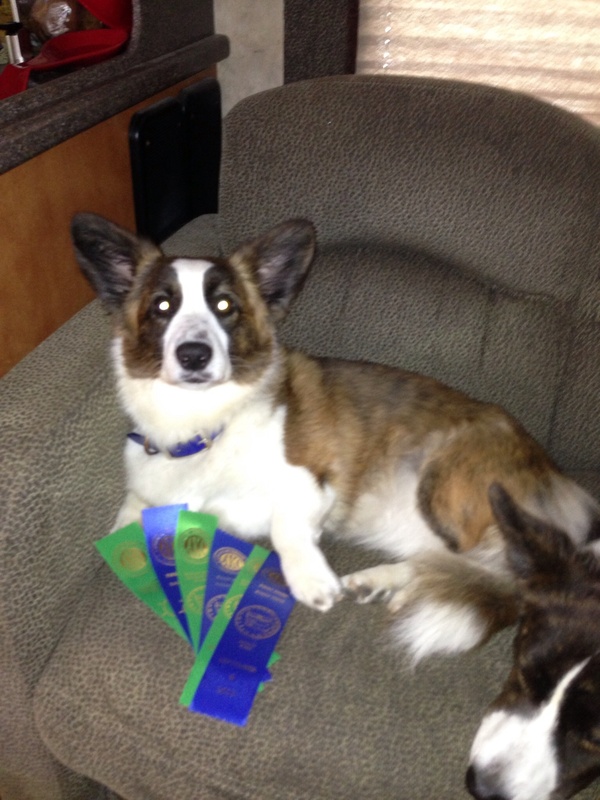 We packed up Shaker, Ella, Rainbow, Russ and four (4) puppies (Olathea, Lincoln, Nadia (Faith) and Missy) and headed to Ohio for the Cardigan Welsh Corgi National Specialty. We were gone nine (9) wonderful, fun packed days. The kiddos played in mud, grass, water, learned to potty on leads, travel in an RV, enjoy the sights and sounds of grooming and ring side. They also all enjoyed being loved up on by TONS of different people. To add to the fun, they all met the most wonderful momma St. Bernard. She laid down and let each of the kiddos approach at their own pace. Of course, they played with other puppies and well mannered cardigans. On Sunday, we pointed the bus toward home. The last quarter of the trip was rainy, so I and my fellow caravan driver were quite tired when we pulled into Riverbend. Then the real circus began. Move this car, unhook that one, unload and reload this car, put the tow vehicle in the garage, then back the first bus into the driveway, then the second Class C. All of this was accomplished in a matter of minutes as we were essentially blocking our entrance road! Just as we finished this crazy round, Kate and Joel arrived to gather their new puppy…Faith now known as Nadia. Round two…print contracts, gather food, shot records, registration papers, AVID chip info, toys, health certificate, towels…you get the picture. We were just finishing up with instructions and answering questions, when I remembered we were drying the towel that was to go with Nadia. I opened the dryer and smoke filled the laundry room! SMOKE!!!!! Bless Joel’s heart, he helped us move the dryer out so we could get it unplugged. I walked Kate, Joel and Nadia to the car, and came back to find SMOKE still billowing out of the dryer. Kathy called the fire department, and they wanted the RV’s out of the driveway. Let the circus begin again, except we only got one out before the first fire truck arrived! We live in a rural area and they arrived in about 3 mins! WOW!!!!!!! Suffice it to say, it is a puppy send off, I will never forget, and I am sure the same is true of Kate and Joel. Well, Nadia, it is not good bye…it is “until me meet again.” See ya around the pond, baby girl. Rocky’s new mom reports he is confident and athletic. She says, he happily accepts all that comes his way. But I am most pleased to report that she says he is house broken! Can you imagine at 9 weeks? Well among his many outdoor chores he helps feed the chickens. They are bigger than he is right now, but that won’t go on for long. Glad he has gotten used to them while he is small. I couldn’t be more pleased that Rocky is so loved and that he is bringing much joy to his new home. Without further ado…A Rocky slide show! How I do enjoy playing and teaching puppies! We went out front today to experience concrete, different flora and fauna and learn about recalls. (You will find the recall play in a embedded video post) But for now a slide show of candids!